Addiction to methamphetamine is one of the most prevalent types of drug addiction today. At present there are over 1. 2 million people who are addicted to meth across the globe. On average, more than 100,000 emergency room visits can be attributed to the effects of the potent drug every year. Moreover, it seems like the popularity of meth has grown exponentially, especially for young people. According to recent studies, 1% of teenagers between 14-18 years old have tried meth at least once. Methamphetamine addiction is a serious disease that deserves not only attention but focused meth addiction treatment. 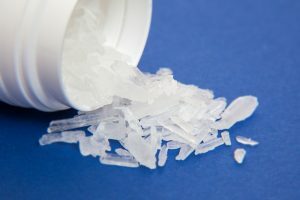 Methamphetamine, otherwise known as crystal meth, meth, crack, speed, or chalk, is a white, odorless powder or crystal made from the amphetamine medically used in bronchial inhalers and nasal decongestants. In some cases, methamphetamine is used to treat ADHD and obesity in adults and children. Moreover, it is prescribed for narcoleptics and people who are suffering from hypersomnia. Recreational use of crystal meth gained popularity in the 1980s. At the time, a smokable form of meth was popularized. Similar to its powdered form, the smoke is odorless. The intense high and quick effect increased the popularity and danger presented by the drug, increasing instances of meth addiction across the USA. Methamphetamine is a powerful stimulant that even in small doses can facilitate an increase in wakefulness. It is highly addictive, since users experience a general sense of wellbeing after ingesting the drug. Users often experience a “rush” upon smoking or injecting meth, which lasts anywhere from five to thirty minutes. This rush often results in a heightened and delusional sense of intelligence and importance. This intense experience, along with the physical symptoms of addiction, make meth a very addictive drug which requires drug addiction treatment centers’ assistance in giving it up. Meth also decreases appetite and increases productivity. Some users abuse meth in order to suppress their appetites and prolong their sexual performance. All types of therapies have varying efficacy and results for each patient. There is no one-size-fits-all treatment for methamphetamine addiction. It is important to find the best and most effective therapy. Medications that can help deal with withdrawal symptoms are sometimes prescribed for recovering addicts. However, at present, the Food and Drug Administration has yet to approve one drug that can treat methamphetamine addiction.